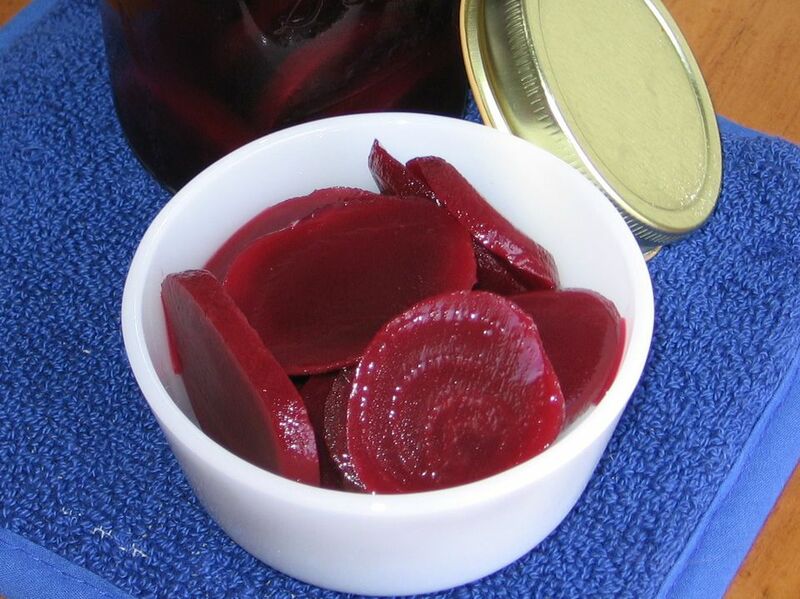 Pickled Beets (Buraczki Marynowane). © 2008 Barbara Rolek licensed to About.com, Inc. When you have a bumper crop of beets, or you can't resist buying a bushel at the farmers market, "put them up" to be enjoyed year-round. Choose small, young, blemish-free beets and can them whole or slice larger ones. If you can't find small beets, slice larger beets so they will fit in your canning jars. Pack peeled beets firmly in clean, sterilized pint jars, leaving 1/2-inch headspace. In a medium pot, combine remaining ingredients and bring to a boil. Divide among beets, pouring into jars to cover completely but still leaving 1/2-inch headspace. Cover jars with new, sterilized lids and rings, tightening slightly. Process in hot-water bath at 195 degrees for 15 minutes, making sure tops of jars are covered by at least 1 inch of water. Using tongs, remove jars and listen for popping noise to signify a good vacuum seal. If the lid dents, the jar has not been processed correctly and consume the contents the same day or discard. Cool and store with or without the rings for up to 6 months. Note: Before attempting a home canning project, read what the Ball canning jars company has to say about it.